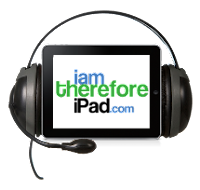 I am Therefore iPad: iAmThereforeiPad Podcast #2 - iPad 2 Mania and What is on my iPad? iAmThereforeiPad Podcast #2 - iPad 2 Mania and What is on my iPad? iAmThereforeiPad Podcast #2 - iPad 2 Mania and What's on my iPad? iPad 2 - Long Lines across the US for iPad 2 sales. iPad 2 Mania video with iMovie, Will Amazon make a tablet, Soundnote, Burn the Rope HD, NYTimes.com charging for content, a peek inside the iPad 2 via ifixit.com, a quick look at Garageband. 7 Reasons Why Every Networker Should Buy An iPad.